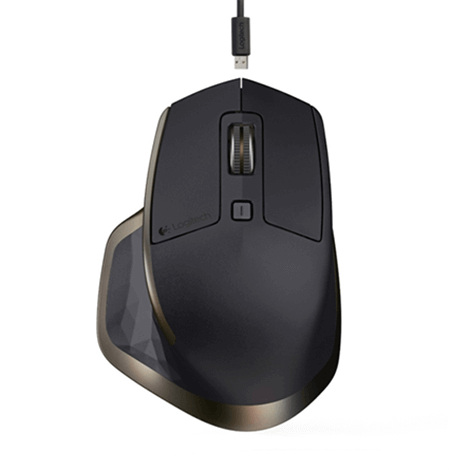 The Logitech MX Master is a power-pack wireless mouse that delivers the best speed. It uses Darkfield Sensor that supports up to 1600 DPI, which is pretty good for speed, even when you play some of the most powerful games. The bottom limit of MX master is 400 DPI. 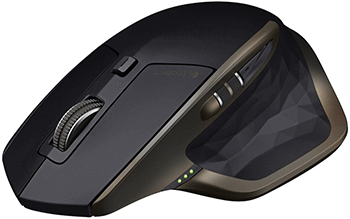 While this Logitech MX Master gaming mouse has an abundance of high-end features that a gamer wants in a professional mouse, the best features of MX Master include the Easy Switch button, thumbwheel, and speed adaptive scroll. With this mouse, you can operate three computers or laptops; yes, you can connect this mouse with three machines that have Windows or Mac operating systems. It comes with a unifying receiver, which can be used to connect it to different machines. You can also use Bluetooth Smart technology to use it with a maximum of 3 machines. The Easy switch button at the top of the mouse just after the scroll wheel will let you switch between the connected devices. If you are a gamer who frequently uses horizontal scrolling along with vertical scrolling, then the thumbwheel and speed adaptive scroll will be handy. This speed adaptive scroll provides an auto shift feature, which gives super fast scrolling. And, if you want to customize the buttons, go for it, because the Logitech MX Master gives you the possibility to customize all buttons. The connectivity limit is up to 30 feet (10 meters), but using it within 15-20 feet (5-7 meters) will give you good connectivity. Above this limit, you may experience that connectivity and tracking are being disturbed; however, it will work with little disruption. The battery life is tremendous. Once it is fully charged, you will not need to recharge it for a month. According to the company, the Logitech MX Master offers the battery life of 40 days, but nobody will wait until the battery has completely finished. It has a battery indicator on its left side that informs you about the battery level. When you see the red light, then it is the indication to charge the device. You can even use this mouse when it is in charging mode. It has a USB connector on the front, from which its batteries can be charged. The charger is pretty fast and will surely make you think what has been making the charging too fast. If you will be charging it for just 2 minutes, you will get backup for about 2 to 3 hours.